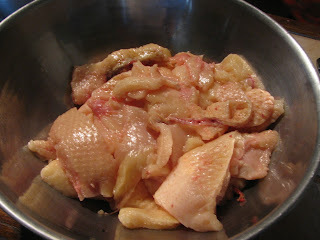 The pieces and parts, including the skin and fat, from Wednesday's ducks were our focus on Thursday. 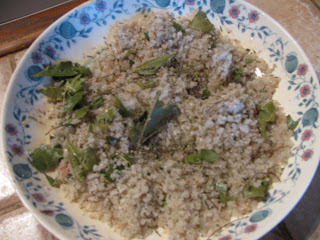 Christiane made a rub of coarse salt, freshly ground pepper and a variety of fresh and dried herbs which we rubbed over all the duck parts on Wednesday before we called it a day. 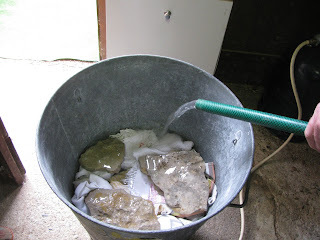 The first thing we did on Thursday was to wipe it off the pieces and pat them dry. 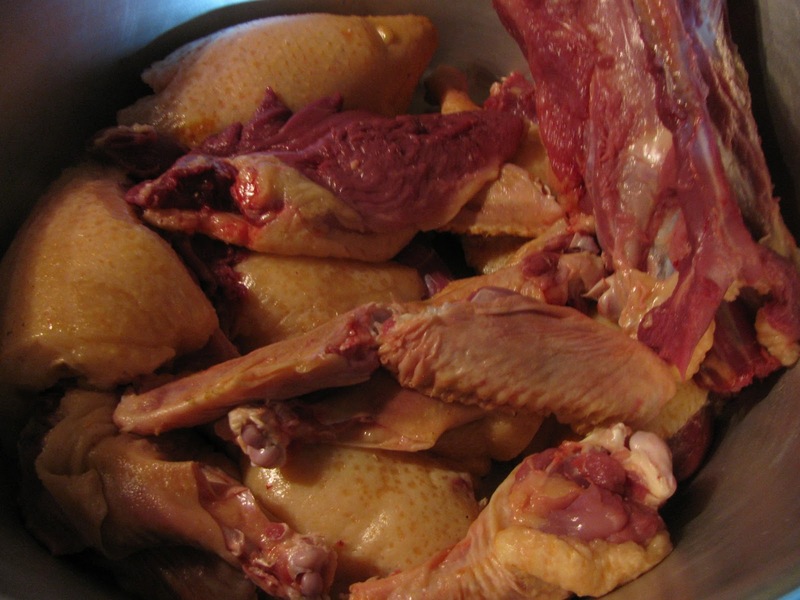 Once the fat was melted, all the parts including the stripped carcasses were cooked for an hour and a half. We returned at noon to put them all in jars. 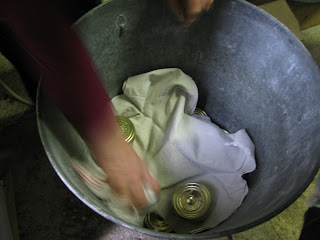 Christiane added 2 ladles of melted fat to each jar, we sealed them, and they went into the big processing pot to process for another hour. Christiane moves so fast it's hard to get a photo of her in action without a blur! The jars are wrapped/padded with dishcloths to keep them from rattling, and some flat stones are placed on top to keep them from floating. Jean-Paul filling the big processing pot with water. I picked up my jars today. The three large ones hold the stuffed neck, the legs, and one has mixed pieces...wings, gizzard and parts of the back. 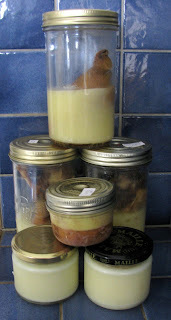 Two of the small jars are duck fat for use in frying potatoes, vegetables and meat. 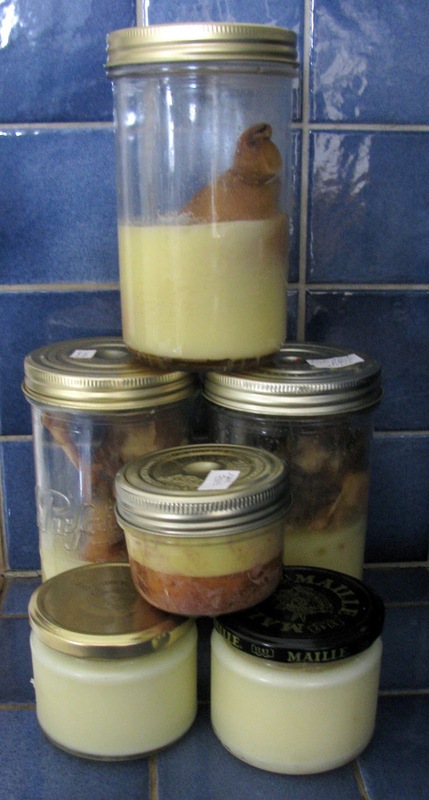 The top small jar is pate. I also have a small jar of fritons in the 'fridge. Fritons are bits of duck and some fat that Christiane skimmed out of the melted fat pot and put through a food processor. It's used like pate to spread on bread or crackers. I have one more piece of the 'doing ducks' story to share. That's for tomorrow, so please come back! Christiane is so generous with herself! And she's a great teacher.